Bring a smile to your heart! Is there a law that a romance heroine must be either English, American, Scottish, or Irish? I was born in California to a Hispanic father and an Anglo mother. My childhood was blessed with influences of several cultures. Later, I married a true Oklahoman and learned all about the Sooner Spirit. The Oklahoma Land Run of 1889 sounded like a great backdrop for a romantic adventure. Who would be a good heroine? She wasn’t loco. She was smart, clever, and courageous. Definitely heroine material. 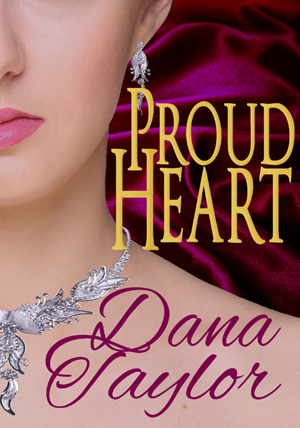 PROUD HEART is entirely fictional and set in a time period before my grandmother was born. But, the hearty souls who made a run into the Unassigned Lands might have included a strong-willed Latina very much like Rosa Dominguez, my proud-hearted grandmother. Rosa sat at her vanity table watching the earrings dangle from her ears; the stones caught the afternoon light, sparkling about her pretty face. Her old nursemaid, Pilar, sighed. Soon the niña would be a young woman. Rosa prattled, playing in her make-believe world, “I am going to marry an officer and we shall have a fine hacienda with many servants. In the afternoons he will come home and we shall drink spiced wine under the jacaranda trees before taking our siesta. We shall entertain dignitaries from Spain and our children will go to the finest schools in Europe.” She picked up a shiny necklace from a jewelry box and placed it around her fair neck. Pilar shifted on a hard chair working on the never-ending mending of her charge’s clothes. The nurse’s tired voice agreed, “Sí, mamacita,” as she continued stitching a fine seam. The girl loved spinning her grand dreams. Of course she came by them naturally with the way the doctor fed his daughter illusions of grandeur. Never forget, Princess, you have noble blood coursing through your veins. You are pure Spanish. When you are older we shall send you to finish your studies in Spain before you marry. That is the way of nobility. Rosa preened before her mirror. Pilar admired the girl’s fair European features. Her dark brown hair gleamed with red highlights, now pulled straight back showing off the dramatic widow’s peak on her forehead. Jeweled combs sparkled behind her ears. She placed the diamond tiara on the crown of her head. Her full mouth smiled at the dazzling image before her; glittering earrings, combs, tiara and necklace adorned her youthful face. Though dressed in a plain, white school girl’s dress, the niña carried herself like a true Princess, bowing to an imaginary prince at her first ball. Pilar’s heart contracted knowing the political winds blowing might very well extinguish her beloved Rosa’s vision of an aristocratic life, the life she’d been born for. Pilar bit back thoughts of a different reality. Rosa might be lucky to marry a merchant and run a store. The old doctor was not doing his daughter any favors by filling her head with dreams of days gone by. At that moment a great crash resounded from downstairs. Pilar dropped her mending. Rosa gripped the back of the chair. The room vibrated, blurring her image in the mirror as the glass trembled. Shouts and screams sounded above the strange rumbling noise. But she was too slow to catch her young mistress. Rosa ran down the hall to the top of the staircase and fell to her knees watching the chaos below. Bandits! They rode horses through her house, destroying precious vases, slashing pictures on the walls with their broad machetes. A pair of maid servants crouched behind a large chair, clinging to each other, wailing with fright. Rosa’s mother ran from the dining room and shouted indignities. A burly bandit dismounted his horse and stalked the small, irate woman. “Yes, and he’ll be furious when he sees this invasion. Leave at once.” She pointed to the door. He grabbed her wrist and twisted her arm. From the landing above, Rosa saw Mama cry out in amazement and pain. Rosa screamed and tried to run to the rescue, but Pilar grabbed her. The bandit slapped Mama across the face, still holding her arm. “You aristocracy think you are so much better. Your husband would not treat my woman when she was sick. He turned us away and went back to sip his lemonade when he could have helped her. I lost my wife that day and, today, he loses his.” With that, he drove the large knife into Mama’s belly. The servant girls screamed. Rosa suddenly stopped her struggles as she watched Mama fall to the floor. A dark veil fell over her heart. She shivered with cold. Oh, so cold. The bandits pillaged the downstairs of the mansion. Wild yells and thundering horses rattled the walls. Too stunned to resist, Rosa followed Pilar down the back stairway and out of the house to a copse of trees lining the creek. From their vantage point hidden in the woods, they watched more bandits and peasants converge on the house, breaking windows, removing furniture and family heirlooms. Wrapped in Pilar’s arms, Rosa stood powerless to halt the destruction. She prayed to her favorite saint. Oh, Santa Teresa, help us in our hour of need. Rosa thought her heart could not be filled with any more terror until she saw her father running toward the house, waving his cane and shouting at the marauders. They turned on him like a snarl of mad dogs. The peasants surrounded him with their hatred, beat him with their clubs and sticks. Oh no, oh please, oh stop! The mob cries of blood lust pounded her ears, pierced her soul. Never, never would she forget the sounds or erase the sights from her mind’s eye. Still wearing her mother’s jewels, Rosa sobbed in her nurse’s arms. In the midst of despair, her father’s voice echoed in her mind. Always remember, Princess. You are of the nobility.